I mentioned, in my last post, that Marvel UK's increasingly desperate looking Spider-man weekly, in its final guise as (shudder) SPIDEY COMIC, maximised the free ZOIDS toy promotion insert (which also appeared in copies of RETURN OF THE JEDI and SECRET WARS that week) by also reusing the artwork as the cover! Yup, really! They used a free toy-funded promotion as their cover design. 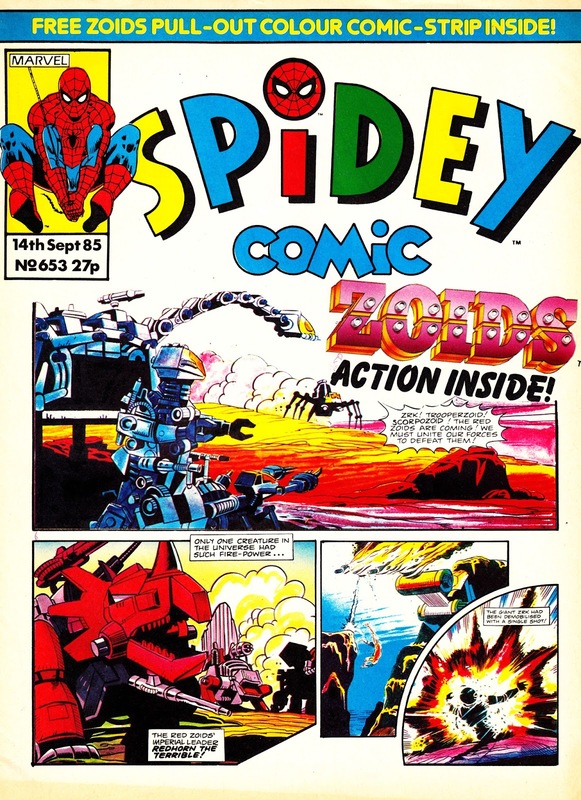 Was this a sneaky way of testing whether the Zoids created a sales bounce (god knows, the floundering weekly certainly needed it) whilst M-UK firmed-up plans for adding a regular Zoids strip to Secret Wars? Or was this just a cash-strapped has-been scrimping on the cost of designing a new cover? Hmmm. Spidey Comic closed at the end of the year after 666 issues. I can't imagine why. This is the worst cover for a comic of all time! And I bet the inside has no merit at all. It also as the worst title of any comic, no child calls Spider-man Spidey. It failed so miserably because it moved the core readership age from 7-12 downwards to 2-4 years old. An age group with little or no spending power. I'd guess slightly older than 2-4 but I take your point entirely. But it shows that - without a TV tie-in to bolster sales (I don't think any of the incarnations of the TV shows were on-air in the UK by this point) Spider-man just wasn't selling. The average age of readers across the industry was dropping and Marvel UK had opened a lucrative new front with licensed younger-reader characters so you can see why they thought (hoped?) that a similar makeover MIGHT work.